If there is material in your job that you want to print right to the edge of the page, with no white border, then you need to provide your job with bleeds. ‘Bleed’ is a printing term used to indicate the area with background printed material that will be trimmed off after the job is printed and cut down to the finished size. Since the bleed area will be trimmed off during the cutting process, there should be no text or other important information in the bleed area. Jobs that make use of image bleed should extend any bleeding background a minimum of 2.5mm outside the final paper trim edge. Page layout and drawing software such as InDesignCC, QuarkXPress, Adobe Illustrator, Microsoft Publisher and CorelDraw allow you to choose the exact page size, and they add a pasteboard area for bleeds and other purposes. If your software does not allow you to set up for bleeds, you need to set up an oversized page. Thus an A4 page (210x297mm) should be set up so that it is at least 215x303mm. You should draw guides to the exact 210x297mm to show you where the job will be trimmed, and any photographs or drawings you want to print to the edge of the page should extend right to the edge of the 215x303mm, thus beyond the guides you have drawn to show you where the job will be trimmed. We recommend all other text and graphics stay inside a ‘safe zone’ printing area which stays inside the final paper trim edge by about 7.5mm. This ensures a more professional appearance and eliminates any risk of type or images being accidentally ‘nicked’ during trimming. 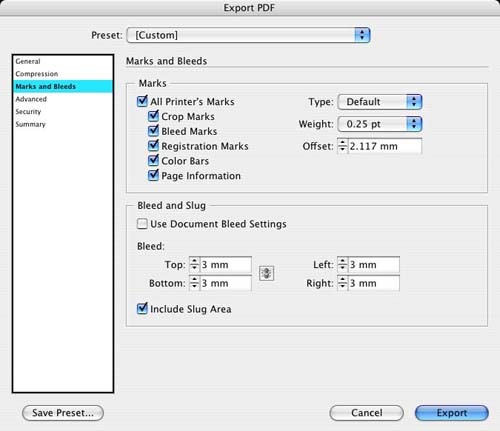 If you are saving your job as a PDF file, it is crucial that you save it with bleeds and crop marks. Usually the first step in creating a PDF file is to save a Postscript file of your job in the software you have used to create it (but see the next paragraph for one important exception). You will need to set the job up as if you were going to print it on an oversized sheet, allowing for bleeds and crop marks. Then save the Postscript file (another term for saving a Postscript files is ‘save to disk’), and distil a PDF file (using Acrobat Distiller). Open the PDF file you created to check that it has bleeds and crop marks before you send it to us. If you are creating a PDF file out of Adobe InDesign CC or other Adobe CS products (PhotoShop or Illustrator), you don’t need to save a PostScript file. However you do need to make sure the appropriate settings are correct. Here is a screen shot from InDesign that shows how to set your job up with crops and bleeds. We do not charge extra for bleeds.